Chestnuthill Township offices are located at 271 Route 715, Brodheadsville, PA 18322; phone: 570-992-7247. 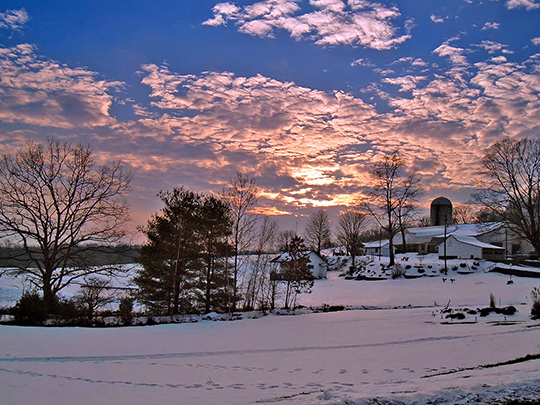 Photo: Farmstead in Chestnuthill Township. Photographed by User:Nicholas (own work), 2005, [cc-by-2.0 (creativecommons.org/licenses/by/2.0)], via Wikimedia Commons, accessed August, 2018. Chestnuthill Township  was founded on September 20, 1763. In the time before the chestnut blight of 1900, Chestnuthill was named for an abundance of chestnut trees which filled the area's rolling hills. Historically, farming has been the main industry, and the supporting services were established to serve the needs of these residents. As the Township continues to grow, farming still remains an important part of the community; however, businesses have developed to meet the needs of a growing population. Chestnuthill Township 2017 Annual Report, www.chestnuthilltwp-pa.gov, accessed August, 2018.